Douglas Adams famously described the New Zealand native kakapo as the ‘world’s largest, fattest and least-able-to-fly parrot’. The males can grow up to a whopping 60cm and both males and females are a beautiful mottled green and yellow with black flecks. It may also be the world’s longest living bird with a suspected life expectancy of about 90 years, although the jury is still out on that one. 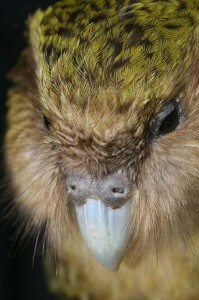 However there is no doubt it’s now one of the rarest parrots, with only 124 known individuals left, specially sequestered on three islands off the coast of NZ. The kakapo has a commonly used ‘Skraark’ sound, which you can hear here and a ‘Ching’ which can be heard here. It also has an amazing mating call, a sub-sonic ‘BooOOoooom’ which can travel for kilometers. You can hear it booming here. When the male kakapo is ready for mating (on average once every 2 – 4 years), he climbs up the side of a hill and then scratches out a little shallow pit, a ‘ track and bowl system’, which is great for further amplifying his booming call. The male kakapo can boom all night in the hope of attracting a female. The kakapo are unusual for a variety of reasons, one of the most heartbreaking is that it freezes when disturbed. Although I assume the evolutionary reason for that is so it blends in with it’s surroundings, it only makes it easy pickings for any hungry predator that comes across it. Another is it’s very strong smell. This may be for alerting other kakapo to it’s position, but it also clearly works for predators looking for a tasty meal. The Maori has strong cultural, spiritual and traditional associations with the kakapo, even naming it the word for ‘night parrot’. They hunted it for food, told stories about it and made garments and cloaks out of it’s skin and feathers. A cloak from kakapo feathers would have only been for people of high status. 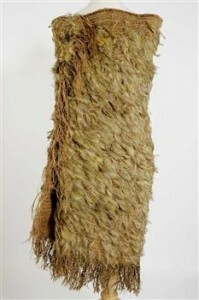 At the right you can see a kakapo cloak from the early 1800s with an estimated 11,000 kakapo feathers. Beginning in the 1840s, European settlers cleared vast tracts of land for farming and grazing, further reducing Kakapo habitat. They brought more dogs and other predators, including cats, rats and stoats. 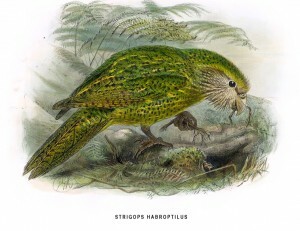 Europeans knew little of the Kakapo until George Gray of the British Museum described it from a skin in 1845. 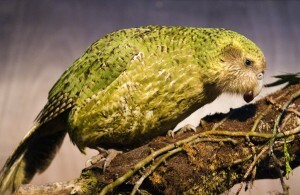 As the Māori had done, early European explorers and their dogs ate Kakapo. It was said you could go to any tree and shake it and kakapo would fall out like apples. From the 1870s, the people of New Zealand knew that the kakapo were in danger of extinction. From 1891 to the 1920s there were three attempts to move the kakapo to the relative safety of islands but each time the populations were decimated or wiped out completely by introduced predators. in the 1950s, the New Zealand Wildlife Service was created,a government agency charged with caring for New Zealand’s wildlife. From 1949-73, the Wildlife Service made more than 60 expeditions to find kakapo, six were caught, but all were males and all but one died within a few months in captivity. By the early 1970s, the situation had become critical. A new initiative was launched in 1974 at which time no birds were known to exist. By 1977, 18 males had been found in Fiordland but with no females known to exist, the species seemed doomed. Our dog gets disorientated when we take her visiting to friends houses. I cannot fathom the difficulties and dangers associated with moving an entire endangered bird around various islands over two decades! To monitor the population continuously, each kakapo is fitted with a radio transmitter and each is given a name. You can see the list of kakapo and their family tree here. At this time there are only 124 known birds left on all three islands. While that’s a heartbreaking number, if you consider the fact that 26 years ago there were only 18 known individuals, things are starting to look up. But it’s still a long hard road even to take the species from it’s current rating of ‘critically endangered’ (faces an extremely high risk of extinction in the immediate future) to an ‘endangered’ rating. The kakapo are a beautiful bird that deserve to not only live but thrive. They’re on the journey of recovery but it takes an entire community of dedicated people to ensure their survival. Journey – The Kakapo of Christchurch looks at the parallels of the recovery of the kakapo and Christchurch. 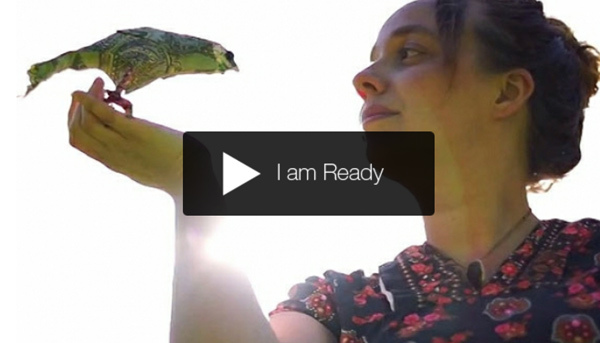 It aims to use one of New Zealand’s most beloved birds as handmade gifts for the people of Christchurch and to remind them that there is still joy to be found, even in the rubble. It also helps raise awareness of this dreadfully endearing flightless parrot and it’s plight only millimetres away from extinction. Can you help me spread a little guerrilla kindness? Just popped into your site now from Stuff.co.nz and am looking forward to having a look around. Hope the Kakapos are faring well and happily.